Alcohol Ink Jewelry – Paper Beads With A difference. 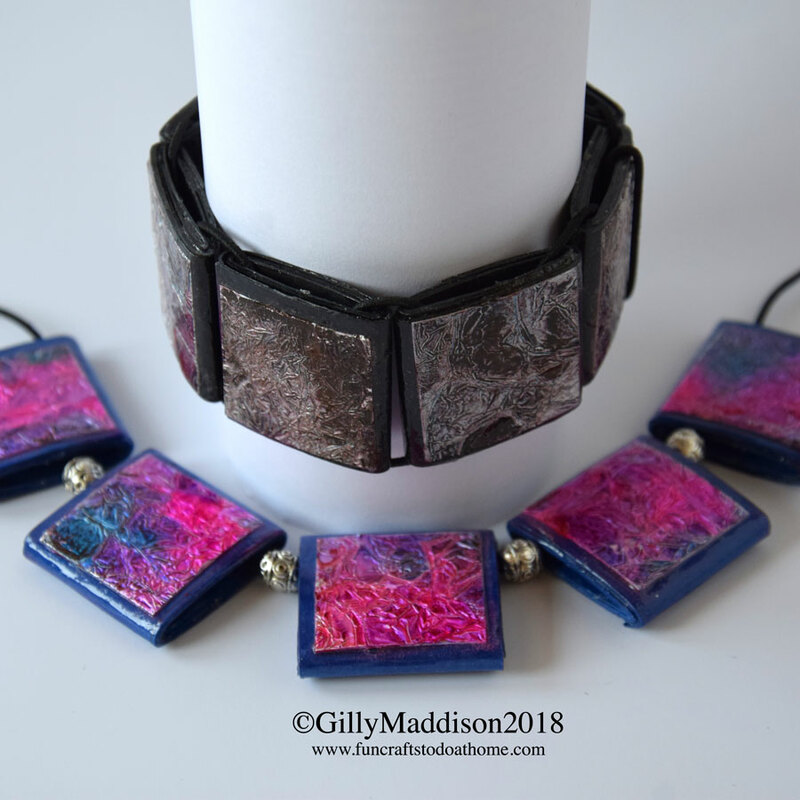 21st April 2018 by Gilly·Comments Off on Alcohol Ink Jewelry – Paper Beads With A difference. Alcohol ink is one of my favorite mediums to work with. It\'s versatile - you can do so much with alcohol ink from all the standard craft applications to practically anything you can dream up. But alcohol ink can be messy - so wear gloves unless you want heavily stained fingers! This project is one of my latest ideas for using alcohol ink with aluminium foil. I have explored this before and my videos showing how to make my \'Moon Glow\' pendants have been some of my most watched, most popular videos on YouTube. To see my previous posts using alcohol ink, click on the links below. Alcohol Ink - Oh My Word! Alcohol Ink On Aluminium Can - Beautiful pendants. Black alcohol ink has never really shaken my world but oh my goodness, it came into its own in this project! If you want to see the video tutorial I made for this project, you can see it by clicking here. You can see how I got the beautiful results for the paper bead tile bracelet using black ink. All I had was the idea (while running on my treadmill which is my ideas machine!) but I didn\'t really know how it would react on the aluminium foil. You can see that although I only used black alcohol ink, the tones that developed when I used the alcohol ink blending solution on the aluminium foil are absolutely gorgeous. These tiles were colored entirely with black alchohol ink and alcohol ink blending solution. The aluminum foil on the right shows what effect you get when you use alcohol ink to color it. I made two different sheets for this project but the sky is the limit really, you could blend whatever colors you want in as many combinations as you want to get all sorts of colorful effects. ...but don\'t know where to get supplies, you can visit my craft supplies page on Amazon. I try to link you to the same products I use or, the closest I can find. This project has probably been one of my all time favourites. Once you have made yourself a selction of colored foils, you can experiment with making card tile beads in different colors to contrast with your hand-inked foils. If you want to make really gorgeous hand-crafted items from card, inks, and aluminium foil, (like the necklace below) watch my video to learn the basics of how to get started. It's really easy and a relatively inexpensive way to craft, once you have invested in the alcohol inks. You can experiment with using junk card from food packaging if you don't want to buy craft materials. Aluminum foil is really inexpensive to use because you get so much on one roll!. The main investment is in the inks, the blending solution and the Glossy Accents glaze. I hope this post and my YouTube video have inspired you to make some beautiful, fun jewelry! If you do have a go at this project, don\'t forget the take care of yourself and the surfaces you work on. Alcohol ink is strong smelling, it stains skin and work surfaces so be sure to use rubber gloves, a face mask and plastic table cover.